So, You Want to Start an Escape Room Business? A Continuing Series. This is the second article in a new series for people thinking that they might want to open an Escape Room business. This week we dispel some myths and offer advice. The Escape Room business is experiencing exponential growth, and that's no lie! The Facebook groups for Escape Room Startups and Escape Room Owners is a thriving community with owners and soon to be owners from around the world. The lively discussions are a great source for inspiration and exchange of ideas. These groups are also a great place to find lessons learned from people who have been in this business from nearly the beginning. Recently, AJ Hughes, owner of Escape Room Tucson prompted a great thread in the Escape Room Startups group with her suggestions for 20 tips for new or possible escape room owners. 1. Create original games or buy really good games. There are some great sellers and bad sellers, pick a good one, don't go for the cheap one to save money. Your game is how you make money, it has to be good and fun. Caveat Emptor is the principle that the buyer alone is responsible for checking the quality and suitability of goods before a purchase is made. Ask questions of your soon to be supplier. Get testimonials from other buyers and find out if they are satisfied with the products. Games can be VERY EXPENSIVE ranging from hundreds to tens of thousands of dollars. If you buy a plan that you don't understand, or worse yet it is written in a language you don't understand you may throw thousands of dollars, Euros, Francs, or Deutsche marks away. Research, research, research!!! Do your homework and you won't get burned by a poorly written game plan. 2. Know that you probably won't have a lot of booking for your first three months. Alas, this is so true. When we opened Cracked it! Escape Games a year ago, our town did not have an escape room. We were the first. We were the third company in our region and awareness of escape rooms by the masses was near zero. I won't say that this is the case for every Escape Room business that opens, but it is true for most. There are some extremely lucky businesses that have great market penetration before they open and have created a buzz. However, that is a rare instance. Most of us have to work extremely hard to get those first customers in the door. This is not a business where if you build it, they will come necessarily applies. A year in we still have people say to us every day, we didn't know you were here. Open your doors expecting a slow start, be happy if you are met with a rousing reception. 3. Have enough capital to run your business for 3-6 months with no income coming in. According to the Small Business Administration, one of the top reasons that businesses fail is lack of operating capital. You absolutely need a cushion between you and failure. Here is a personal example of how tenuous your success or failure may be. We exhausted ALL of our startup capital getting our business open. We opened with exactly $965 in our operating account and we had the confluence of two major financial obligations looming. The first was our rent on our building, the second was Payroll. We were fortunate that we did make enough to cover the rent during the first week we were open however, payroll was an issue. We wrote a check out of our personal account to deposit into our payroll account and write the checks. Fortunately we picked up momentum but had I not had a good paying job at the time we would have been screwed. Having 3 months of operating expenses on hand would have eased this situation significantly. 4. Have money set aside for advertising, a lot. You cannot open an escape room and hope that people will just find you. You have to constantly be marketing and advertising. What's the difference you say? That question is beyond the scope of this article but there are many, many books and articles that can help you figure it out. You MUST set aside a portion of your monthly operating capital to pay for advertising and marketing. The U.S. SBA recommends "As a general rule, small businesses with revenues less than $5 million should allocate 7-8 percent of their revenues to marketing. This budget should be split between 1) brand development costs (which includes all the channels you use to promote your brand such as your website, blogs, sales collateral, etc. ), and 2) the costs of promoting your business (campaigns, advertising, events, etc.)" You may say I can't afford that, I say you can't afford not too. Where you spend those dollars is entirely up to you. Facebook, Google, Instagram, Newspapers, Radio, Billboards, Direct Mail and the list of options goes on and on and on. It can be very overwhelming and EXPENSIVE! There's a saying that When times are good, you should advertise. When times are bad, you MUST advertise. Do no advertising and marketing and see how quickly people come and find you. In a small market like mine I am constantly told how people didn't know that there was an escape room in Jacksonville, North Carolina. 5. Don't copy other companies in your area. It's a d**k move, be original. As Wheaton's law states, "Don't be a d**k." There's a saying that imitation is the sincerest form of flattery, yeah, not so much. There will always be some small similarities between escape room companies because we all provide the same service. However, plagiarizing ad copy, lifting images from their website, using their press releases word for word and various other offenses is a d**k move. It also smacks of a lack of creativity and integrity on the part of the plagiarist. You should do everything in your power to differentiate yourself and stand out from the crowd. What makes our business unique in a sea of similar businesses. What is your Unique Value Proposition? Identify that and promote that. 6. Don't steal ideas from other owners, unless you ask. Be original. Most of us start as escape room enthusiasts and are bitten by the bug. We grow a strong desire to open our own business when we see the possibilities that are out there. We are inspired and our imaginations run wild with ideas. Then we take a leap of blind faith and open our businesses, many of us on a whim and having no prior experience or knowledge on how to open, manage and grow a business. Then we realize that we are not creative, innovative or original and we may have jumped into the deep end of the pool but we don't know how to swim. 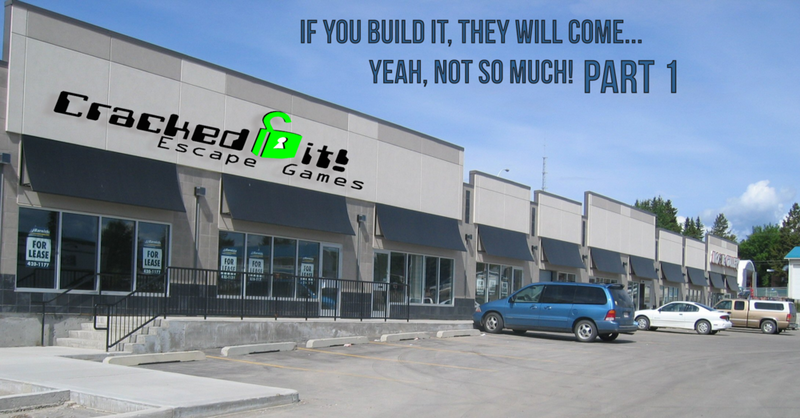 While this is not true for the majority of us, there are a certain element who when faced with a dearth of ideas may be tempted to visit other escape rooms and rip off their ideas and implement them in our own games. DO NOT DO THIS! Directly ripping off your neighbors is, well, un-neighborly and can lead to bad blood between businesses. The great thing about this business is the creativity of it's owners and the willingness to share ideas and yes even offer assistance to make that really cool prop. If you doubt what I say stop into the Facebook group Escape Room Technology and Props group and ask a question. Don't know how to code? Ask and you will receive help. Don't know how to build an analog prop? Ask and you will receive help. All you have to do is ask. 7. Don't buy cheap locks or props. Spend the money the first time otherwise you'll spend 3x the amount replacing it over and over. Again, Caveat Emptor. If you buy cheap props they will inevitably break during a crucial part of a game making the experience less than awesome for your guests. This makes you look like an amateur. Sure it's costly on the front end to pay top dollar and have high quality design, props and puzzles. The last thing you want in a business like ours is to develop a reputation of low quality and cheapness. It will undo all of your work very quickly. 8. Have a backup of everything. When that crucial game piece gets dropped and broken you MUST have a go to backup. If you have a fancy electronic prop and it fails (note: it will) ensure you have a workaround ready to swap in immediately. Have a contingency plan ready for that game piece that accidentaly walks out of your game in someones pocket (it happens). Have spare batteries for those flashlights. Have duplicates of paper clues ready. Have replacement directional locks if you use them. This cannot be stressed enough, the last thing you want is a bad review because there were items in your room that were broken, didn't function properly or were just worn out. Again, this will make you look like an amateur and you will develop that reputation as a low end experience and hasten your own businesses demise. 9. Test, test, test and then test, test, test again. Play testing your game must be a priority! Even if you bought a room design from a reputable designer your facility may not be compatible with your scenario. The only way to find out is to run groups through (FOR FREE! Never presume to charge your playtesters for the experience of playing a beta version of your game) and find out where the bottlenecks occur. Are there people standing around looking bored? Is the game flow a mess? Is your fancy $4000 sarcophagus laser puzzle aligned so that it triggers the smoke and mirrors? The only way to know is to test, test, test, adjust, and test, test, test again. 10. Don't use other companies/competitors names in your ads. You're intentionally trying to deceive players, bad move. Much like ripping off someone else's games and puzzle design is bad, using your competitors names in your ads is just shady. Trying to leverage neighboring businesses that have been open for some time longer than you to help you climb in search rankings smacks of desperation. It also leads to bad relations between businesses. One of the primary truth's about this business is that we thrive off of referrals from other escape rooms. Just like people here don't know that Cracked it! Escape Games has been open for a year now, they also don't know that there are other escape rooms like mine in neighboring towns. We constantly refer people to our "competition" we have their promotional material in our lobby and we mention them when we are walking people out.